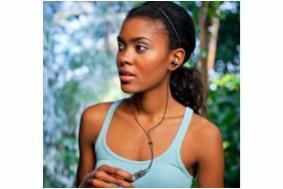 Klipsch launches earphones for the great outdoors | What Hi-Fi? Priced at £120, the S5i earphones have an iPhone-compatible integrated mic and a moisture-resistant three-button remote control. The earphones come with a storage case that should not only keep them safe from the elements but also provides an integrated flashlight, should your outdoor adventure get the better of you. Also supplied are Klipsch's own oval ear tips, which claim superior noise isolation and a lightweight, comfortable fit. The remote and mic are supported by the iPod nano (4th generation and later), iPod Classic (120Gb, 160Gb), iPod Touch (2nd generation and later), iPhone 3Gs, iPhone 4, and iPad. The remote will also control iPod Shuffles (3rd generation and later). Interested? Klipsch has even put together a handy video to show you just what you get can get up to with the S5i earphones. Priced at £120, the S5i Rugged is available for purchase at Amazon, Klipsch and other selected retailers.